For decades, Dr. Jeffrey Bland has been on the cutting edge of Functional Medicine, which seeks to pinpoint and prevent the cause of illness, rather than treat its symptoms. Managing chronic diseases accounts for three quarters of our total healthcare costs, because we’re masking these illnesses with pills and temporary treatments, rather than addressing their underlying causes, he argues. Worse, only treating symptoms leads us down the path of further illness. 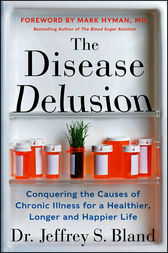 In The Disease Delusion, Dr. Bland explains what Functional Medicine is and what it can do for you. While advances in modern science have nearly doubled our lifespans in only four generations, our quality of life has not reached its full potential. Outlining the reasons why we suffer chronic diseases from asthma and diabetes to obesity, arthritis and cancer to a host of other ailments, Dr. Bland offers achievable, science-based solutions that can alleviate these common conditions and offers a roadmap for a lifetime of wellness.